Let’s consider the database layer and application layer. 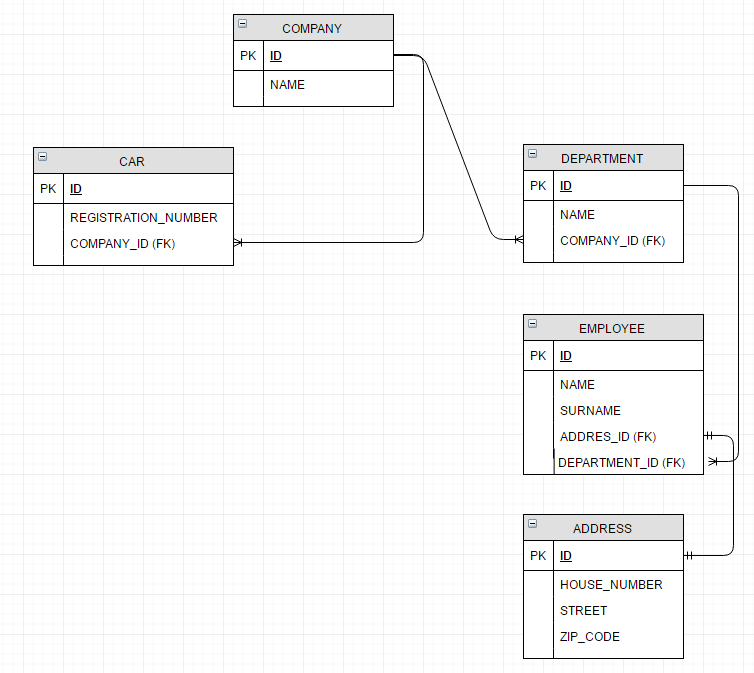 The below diagram shows relationships between data tables. Our main object type is Company, which we will want to cache. Company is related to many other tables; some of the relationships are OneToMany, so querying the whole structure might be a time-consuming operation. Let’s see how to enable caching and work with cache regions. To enable the annotation-driven cache management capability in your Spring application, we need to add @EnableCaching annotation to configuration class. This annotation registers CacheInterceptor or AnnotationCacheAspect, which will detect cache annotations like @Cacheable, @CachePut, and @CacheEvict. In this post, we are going to use the EhCache provider. The below example shows cache enabling with EhCache-related beans in a separate configuration class. Overriding these two beans is not needed if you want to stay with the default definition, but we wanted to make cache transactions aware to synchronize put/evict operations with ongoing Spring-managed transactions. Storing companies by name. For both regions, the maximum elements kept in memory is 10,000 and the maximum time for the company before it’s invalidated is 60 minutes (for more detailed configuration, go to EhCache Official Reference). Let’s look at populating with @Cacheable, invaldating with @CacheEvict, and updating with @CachePut. The @Cacheable annotation indicates that the result of invoking a method (or all methods in a class) can be cached. Each time an advised method is invoked, the caching behavior will be applied, checking whether the method was already invoked for the given arguments. In the example below, we want to cache Company objects in the company.byId cache region. The key in our region is the Company ID field. To handle something other than cache example test data (name starting with test), we can add a condition based on the result object (object returned as a result of a method). The next time the repository method is invoked, data will be gathered from the cache. The example below shows an implementation for caching data based on the name. 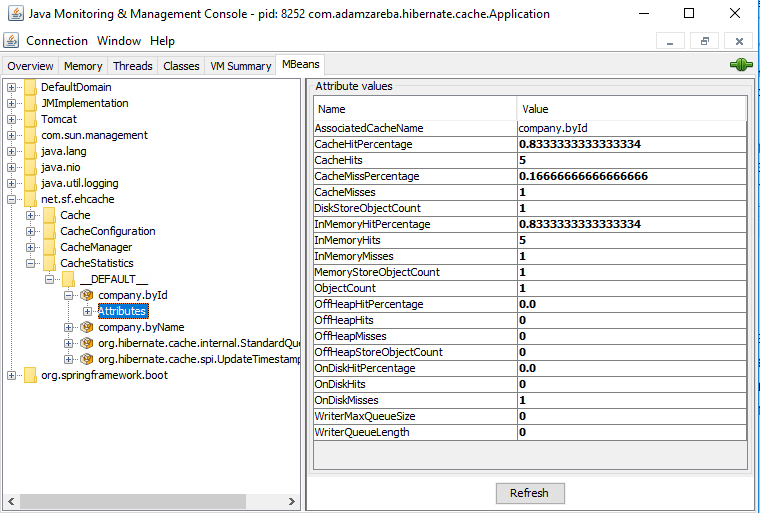 The @CacheEvict annotation indicates that a method (or all methods on a class) triggers a cache evict operation, removing only specific or removing all items from the cache region. With the @CachePut annotation, it’s possible to update the cache. In the below example, the cache for storing companies by ID is updated. It’s worth noting that since the company name is mutable, we cannot update the cache because we don’t know the old name value for that company. To proceed with that, we remove all entries in the cache for companies by name. In this post, we covered basic cache operations like getting, inserting, removing, and updating. Defining these operations and more complex requirements (like conditional caching or cache synchronization) is straightforward with annotations. The source code for above listings can be found in the GitHub project company-structure-hibernate-cache.